A-1 Merchant Solutions, an agent of Harbortouch, proudly presents the Harbortouch first electronic cash register with integrated credit card processing. This exclusive technology now delivers the ultimate payment solution and it’s yours free of charge! * Designed with the most demanding restaurant and retail environments in mind, this ECR delivers rugged hardware and stylish design while offering a wide range of useful features. Additionally, the keyboard layout can be customized through a simple and easy to use online wizard, allowing you to know the exact specifications of your register before it ever reaches your doorstep. Complete with cash drawer and backlit customer display, this electronic cash register is the perfect solution for any retail or restaurant establishment. Each electronic cash register comes complete with a secure PCI compliant** integrated payment terminal to enable credit and debit card payments. This secure device supports either dial-up or ethernet connectivity and its sleek, compact design fits easily in the palm of your hand. With a wide array of convenient features including guest check tracking, it is the perfect device to streamline your electronic payment system. 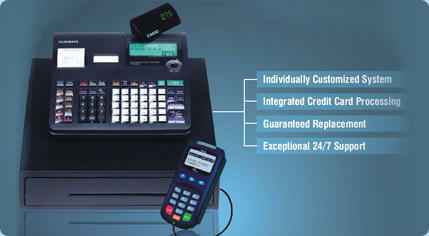 Enjoy all the functionality of an electronic cash register with integrated credit card processing. Contact your sales representative today for more information. *Merchant must have a merchant account with Harbortouch to participate in the free ECR program.